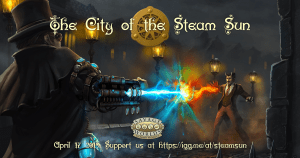 From “Ace” licensee, Steam Sun Games, comes The City of the Steam Sun, a new setting for Savage Worlds Adventure Edition that*casts players into the gloomy realm of steampunk Limbo: an explosive mixture of steam technology and ancient magic, where mystical Victorian horror and adventure are played out under the dim rays of a metal steam sun! Visit The City of the Steam Sun Indiegogo page now to find out more about this unique setting and to pledge your support. And be sure to download the 44-page*FREE JumpStart available now from DriveThruRPG.